The Building is an apartment block, located in the area of Ag. Nectarios, at the corner of G.Fasoulioti & D.Liperti street. Is considered one of the most prominent areas of Limassol, in the center of the town opposite the ARIEL traffic lights of Makarios III Avenue, only two minutes drive from seaside (1300m), in a quiet residential area. Offers an easy and direct access to public and private services, as well as to the main roads and high way of the town. The project consists of 8 apartments with perfect functional layout and architectural study. At ground floor there are storerooms for each apartment, as well as a covered parking place. 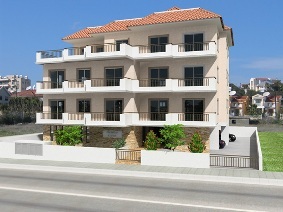 The first floor consists of two apartments of two bedrooms and one apartment of one bedroom. The second floor consists of two apartments of two bedrooms and one apartment of one bedroom. The third floor consists of one apartment of three bedrooms and one apartment of two bedrooms. Reinforced concrete frame based on mat foundation in accordance with the Cyprus Anti-seismic codes of practice. A damp proof membrane course will be provided for foundation and water resistant membrane will be provided for verandas and roof. a) Externally: Brick walls built of perforated bricks 200-millimetre thickness with two layers of lime-cement plaster and grafiato. b) Internally: Brick walls built of perforated bricks 100-millimetre thickness with three layers of lime-cement plaster. All ceilings will be of smooth face concrete, plastered to a smooth finish and painted with three coats of emulsion. Walls will be decorated with ceramic tiles to door height of value euro 10.00/m² and the remaining surface painted with three coats of emulsion paint. Wall of kitchen between the cupboards will be decorated with ceramic tiles of value euro 10.00/m². b) All doors shall be of the hollow core type covered on the outside with beech veneer. Door frames are made of Swedish whitewood. c) All front doors to flats are beech veneer faced and are manufactured to the specification of Cyprus fire Brigade for a half hour resistance. a) All windows and doorframes will be in colored aluminum. All windows and doors shall have double glazing for insulation and soundproofing. b) All balustrades at verandas shall be made of 50mm pipe and strip iron as shown on drawing details. a) Electrical installation: According to the requirements of Electricity Authority of Cyprus. Adequate power points are to be provided. Telephone points and TV aerial points shall be installed in the living room and all bedrooms. b) Water supply and sanitation: Pipe in pipe system shall be used in all installations for cold and hot water. Supply and installation of one ton Solar heater for each flat. Provision for A/C as well as central heating. c) Sanitary Fittings: All sanitary fittings shall be of European origin namely Ideal Standard. d) The lift shall be of European origin. All interior walls to be treated with at least 3 coats of emulsion paint and all internal woodwork painted 3 coats oil paint on primer. All external surfaces to be covered with grafiato.